From MyFoxChicago: At least six people were killed and 12 others were wounded since 5 p.m. Friday in citywide shootings, spanning from a sidewalk next to River North’s nightclubs to a single West Side block where two separate homicides erupted less than 24 hours apart. The most recent reported shooting happened early Sunday in the Albany Park neighborhood on the Northwest Side. At 2:04 a.m., a 23-year-old man was standing on a sidewalk in the 3300 block of West Montrose when he heard shots and felt pain, according to Chicago police. He was taken with a gunshot wound in his right leg to Illinois Masonic Medical Center, where his condition was stabilized, police said. Soon after, a double shooting struck the West Side Austin neighborhood. At 1:52 a.m., officers arrived at the 100 block of North Lockwood Avenue and found the woman, of an unknown age, and a 26-year-old man shot inside a parked car, according to police. The woman had already died from a gunshot wound to the head, police said. The man was taken to Stroger Hospital with multiple bullets inside him and pronounced dead. In the Roseland neighborhood on the Northwest Side, another man was shot in the right leg early Sunday. At 1:45 a.m., the 32-year-old was standing on a sidewalk in the 11000 block of South Wentworth Avenue when a bullet struck him, police said. The man was taken to Roseland Community Hospital, where his condition was stabilized. Saturday’s latest shooting left one man dead in the Gage Park neighborhood on the South Side, according to police. At 10:43 p.m., a 21-year-old man was driving east on the 2700 block of West 58th Street when gunfire entered his vehicle and caused him to careen into a parked vehicle, police said. He was taken to University of Chicago Medical Center with a bullet in his left shoulder, police said, and was later pronounced dead. Yellow crime tape cordoned off the street as Area Central police were investigating the homicide. The 21-year-old’s black Chrysler minivan stood on the street with the back window punched out from the bullets. Another homicide Saturday happened in the same East Garfield Park block where another man was shot to death less than 24 hours before. Leetemi Daniels, 41, was shot multiple times just after 2:30 p.m. in the 3100 block of West Washington Boulevard, police and the Cook County medical examiner’s office said.Daniels was struck in his abdomen and chest, and was pronounced dead at the scene. On Friday, 34-year-old Rodney Jernigan was fatally shot as he walked down a sidewalk in the same block Friday, police said. According to the medical examiner’s office and police, Jernigan was shot in his chest and head, and was taken to Stroger Hospital, where he was pronounced dead. In the morning Saturday, a fatal double shooting unfolded in the Albany Park neighborhood on the Northwest Side. About 5:20 a.m., two men were sitting in a vehicle parked in an alley in the 4400 block of North Bernard Street when someone approached them on foot and opened fire, police said. Roberto Ramirez, 23, was shot in his head and was pronounced dead at the scene, police and the Cook County medical examiner’s office said. The other man, 22 years old, was shot in the face and taken to Illinois Masonic Medical Center in critical condition, police said. Ramirez lived a block away from where he was shot, according to the medical examiner’s office. Last weekend, citywide gun violence left 27 people shot, three of them fatally. 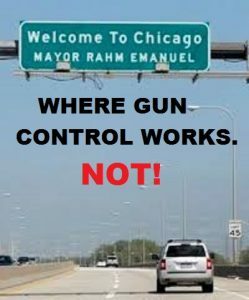 This entry was posted in crime, gun control, Insanity, Liberals/Democrats/Left, Taxes, United States and tagged #2A, Chicago, Chicago Police, Chicago's gang violence, Chicago's gun violence, Chiraq, Rahm Emanuel. Bookmark the permalink. I want the “yellow crime tape” franchise for Chicago. When are all these criminals going to realize that guns are illegal in Chicago? It they were just a little closer to Mexico we could put this to good use. Nothing to see here folks…. Just move along…. Black gangbangers killing other blacks is not news…. Let a Police Officer shoot a black gangbanger and all of a sudden there is rioting. Look at the stink being made about a Police Officer “striking a 14 year old female”…. The media convieniently leaves out that she was fighting with the cops and almost kicked one in the nuts… Of course gun control would stop all of this… Ohh.. Wait… Gun control laws only impact the law abiding…. Never mind…. Chitcago is a lost cause.